Be the first to share your favorite memory, photo or story of Clyde. This memorial page is dedicated for family, friends and future generations to celebrate the life of their loved one. Clyde J. 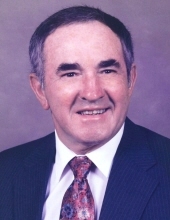 Price, age 94, of Dandridge, passed away early Thursday morning, December 13, 2018. Clyde was born in the Smokey Mountains in Greenbrier, Tennessee to Lee Price and Ola Branam Price. He grew up in Sevier and Jefferson Counties and lived in the Karns Community of Knoxville for over 30 years. He was a member of the First Baptist Church of Dandridge. Clyde was a veteran of World War II serving with the U S Army. He retired from Martin Marietta with 35 years of service as a Maintenance Supervisor. He was a member of Carpenters Local #50 and was an instructor for 35 years for apprentice carpenters. He volunteered at the Dandridge Ministerial Association Food Pantry and the Jefferson County Nursing Home. He was a member of Brazelton Masonic Lodge #190 F & AM, Kerbela Temple and the Scottish Rite Bodies. He drove children to various Shriner Hospitals for many years. He was a 50 years member of the Karns and Dandridge Lions Clubs. He is preceded in death by his wife of 68 years, Ida Margaret Mills Price; grandson, Ian Conrad Payne; siblings, Ruth, Blanche, Gladys and Earl. Clyde is survived by his children, Donna Brasfield, Joe Price, Becky (Gary) Randles, Jackie (Tony) Nelson and Jamie Payne; 8 grandchildren and 12 great-grandchildren; brother, Charlie Price; sister, Pearl (E.C.) Dearing; sister-in-law, Rose Price, brother-in-law, Don Mills; numerous nieces and nephews, great nieces and great nephews. The family will receive friends on Tuesday from 4:30 p.m. to 6:45 p.m. with funeral services to follow at 7 p.m. at the First Baptist Church of Dandridge with Dr. Robert Brown officiating. Family and friends will gather at 10: 30 a.m. on Wednesday for graveside services and interment services at Hillcrest Cemetery with full military honors conferred by the U S Army and the East Tennessee Veteran's Honor Guard. To send flowers or a remembrance gift to the family of Clyde J. Price, please visit our Tribute Store. "Email Address" would like to share the life celebration of Clyde J. Price. Click on the "link" to go to share a favorite memory or leave a condolence message for the family.